AgeUK contacted me a few days ago to ask if I'd join in their Spread the Warmth campaign. Now it's my turn to pass the challenge on - will you join in? This winter, 24,000 older people could die because of the cold. Many of these deaths could be prevented if everyone lived in a warm home. We need to get the message across to every MP – including yours. 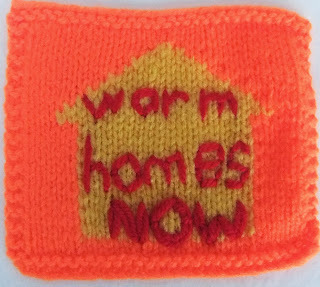 So AgeUK are asking people to knit a message to send to their MP. If you're not sure who your MP is, you can find out by entering your postcode into www.parliament.uk. 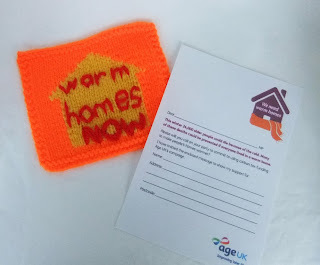 AgeUK also has advice to help people keep themselves warm during the coming winter months - let's all spread the warmth! Please share the link to AgeUK's campaign around your social media and reblog if you can. Thank you. I love the bright orange yarn you've used to knit your square - it looks fab!